One of India’s most enduring artistic traditions is its myriad forms of embroidery. Every state and region boasts of its own style, but needlework is not merely a means of ornamentation. The fabrics are also threaded with stories of the community, with motifs emerging from its natural surroundings, economic state and sociopolitical milieu. As handmade items are reclaimed as new embodiments of luxury, many of these old, and sometimes forgotten, embroidery styles are being revived and popularized. These techniques are popular not only among designers in India but also with international labels. Belgian designer Dries van Noten has worked with embroiderers in Kolkata for decades, and Mumbai is a trade hub for a number of luxury brands seeking Indian embroidery. Labels like Gucci, Valentino, Alberta Ferretti, Maison Margiela and Christian Dior work with the Mumbai-based embroidery firm Chanakya, while Roberto Cavalli, Salvatore Ferragamo, Versace and Michael Kors have collaborated with another firm, Adity Designs, also in Mumbai. In homage to the country’s diverse embroidery traditions, here are some of the techniques that have found new expression in the works of contemporary fashion designers. Integral to the wardrobes of Parsi women, gara embroidery is an amalgamation of influences from India, China, Persia and Europe. Parsi brides traditionally wear gara saris for their wedding, the intricate motifs on fabrics ranging from pagodas and dragons to roses, lotuses, roosters and peacocks. Fashion take: Turn to designers Ashdeen Z. Lilaowala and Mumbai-based Zenobia S. Davar for a contemporary take on gara embroidery on jackets, kurtis and dupattas. In 2016, the Delhi-based Lilaowala collaborated with textile label Ekaya to create handwoven gara Banarasi silks. Kashida is a popular Kashmiri needlework technique, traditionally used on garments such as stoles, woollen pherans and rugs. Evocative motifs like birds, blossoms, fruits and trees—particularly the chinar—are created, usually in a single-stitch style. Another form of Kashmiri embroidery is aari, wherein floral-inspired motifs are embroidered in fine chain stitches using a hooked needle. Fashion take: In 2014, Rohit Bal’s Gulbagh collection showcased kashida embroidery while Meera and Muzaffar Ali’s Summer/Resort 2017 collection for Kotwara incorporated aari. Manish Malhotra combined Kashmiri embroidery with Merino wool for his recent Inaya collection. Also known as shisha or abhala bharat kaam, this is the craft of encasing mirrors of varying shapes and sizes to create patterns on fabric. Women artisans from Gujarat’s Kutch region and parts of Rajasthan are renowned for their expert mirrorwork, on garments, homeware and accessories, which are also widely exported. Fashion take: Designers Manish Arora, Malini Ramani, Abu Jani and Sandeep Khosla have employed mirrorwork in their designs. Jani-Khosla’s mirrorwork lehnga for Madhuri Dixit-Nene in Devdas (2002) was also displayed at London’s Victoria and Albert Museum for the Fabric Of India exhibition in 2016. Phulkari, meaning flower work, was traditionally practised by the women of Punjab in their homes. The designs depict colourful motifs embroidered using a long-and-short darn stitch. A mandatory trousseau item for the community’s women, the craft even found mention in Waris Shah’s 18th century poem Heer Ranjha where phulkari was part of Heer’s trousseau. Fashion take: Manish Malhotra’s Threads Of Emotion collection was exhibited at the Philadelphia Museum of Art’s Phulkari: The Embroidered Textiles Of Punjab exhibition in 2017. The embroidery is also used on accessories, like juttis by Fizzy Goblet, and stoles, bags and small items by the Chandigarh-based brand 1469. Originally practised by women in rural Bengal and Odisha, kantha was used to create blankets (in Bangla, the word is used interchangeably for the embroidery and the blankets). The patterns, crafted using a simple running stitch, are themed on daily life, floral and animal motifs, and geometric shapes. Fashion take: Designer Sunita Shanker and label 11.11 by CellDSGN have used modern interpretations of the embroidery technique. An artful technique of metallic embroidery, zardozi uses fine metal wire or thread in gold and silver (or copper wires and synthetic threads for cost-effective designs), to create patterns on fabrics like velvet, satin and heavy silk. Varying from 3D-like patterns to minimal designs, zardozi is commonly employed in bridalwear and couture. 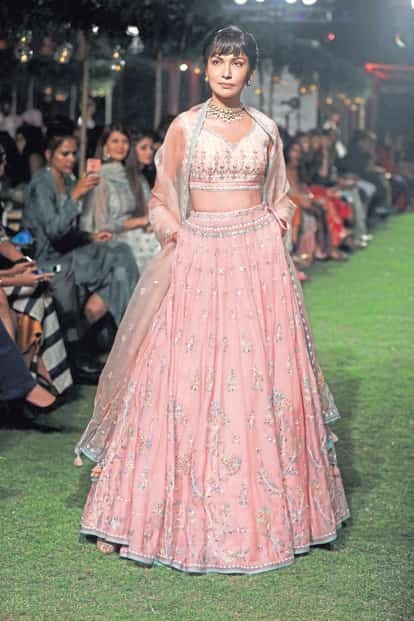 Fashion take: Spot it in the collections of Ritu Kumar, Suneet Varma,Tarun Tahiliani, Shyamal & Bhumika, and Sabyasachi Mukherjee, among others. This embroidery technique practised by women in rural Bihar is akin to an art form. Outlined in chain stitch and filled with running stitches, sujini is also a means of storytelling. The designs often locate a woman’s place in a patriarchal society, with depiction of social evils like dowry or domestic violence, and also showcase their personal aspirations. Fashion take: Emerging label Indigene designed a collection of sujini-embroidered garments in 2017, co-created with women artisans from Bihar and Uttar Pradesh, while Delhi-based textile designer Swati Kalsi also collaborates with sujini craftspersons on new designs. Popularized in Lucknow, mukaish is created by twisting thin metal strips into fabric. Fardi ka kaam, dotted mukaish embroidery, is done by women, while kamdani, done by men, is used to create varying patterns. The labour- and time-intensive craft has gradually diminished and is today known by only a handful of karigars. Fashion take: Mukaish can be spotted on runways, courtesy designers like JJ Valaya and Payal Singhal, who incorporated the craft in her Summer/Resort 2018 collection. Believed to have been introduced in the Mughal court by Noor Jahan, wife of emperor Jahangir, Chikankari is the practice of stitching white untwisted yarn on fine fabrics like muslin, cotton or voile. In recent years, the embroidery is also being done on brightly-hued fabrics or using coloured threads. Fashion take: Sustain, the apparel line from Good Earth, employs Chikan for its Noor Naira collection on white cotton, Chanderi and Malkha, while Delhi-based designer Sanjay Garg’s collection Cloud People introduces new motifs, such as the figures of angels in the design. Indigenous to Rajasthan, where the craft can be seen on lehngas and odhnis as well as turbans, gota refers to strips of gold and silver ribbons that are used to make appliqué patterns on fabrics or butis (small patterns) inspired by local flora, fauna and community life. Originally using precious metals, today’s designs are often made from cheaper copper-coated silver or polyester film known as “plastic gota". Fashion take: Anita Dongre, Ridhi Arora and Yogesh Chaudhary incorporate gota in their designs, while The Scarf Story, an accessories label by Joanna Kukreja, has reinterpreted it on cashmere.